The National Center on Disability and Journalism is excited to welcome two new board members, Amy Silverman and Becky Curran. Amy Silverman is an accomplished journalist, currently the managing editor at the Phoenix New Times. In addition, she is a commentator at KJZZ, the National Public Radio affiliate in Phoenix. 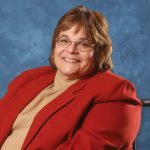 Silverman is author of the book, “My Heart Can’t Even Believe It: A Story of Science, Love, and Down Syndrome” and the blog, “Girl in a Party Hat”. She lives in Phoenix with her daughters, Annabelle and Sophie, and her husband, Ray. Becky Curran owns and manages DisABILITY in Media, which promotes talents of people with disabilities using storytelling and social media. She is also the chapter president of Little People of America in New York City. She has delivered motivational speeches from TEDx talks to schools, corporations and nonprofits. Curran was born with achondroplasia, a common type of short-limbed dwarfism. She works to change the way the world reacts to people with disabilities, including the 30,000 little people that live in the United States. Curran and Silverman join other talented professionals in providing advice and support to the NCDJ.